Piotr Petrovich Belousov was born in Berdyansk on 3rd May, 1912. A follower of Isaac Brodsky, one of the founders of the Socialist Realist art movement. After graduating from the Repin Institute of Arts in 1939, he went to Brodky's workshop. 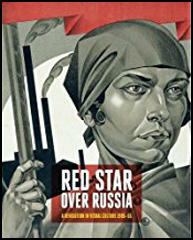 Over the next few years he produced a series of portraits and historical paintings devoted to the life of Lenin. The most famous of these was on the assassination attempt by Fanya Kaplan on Lenin. 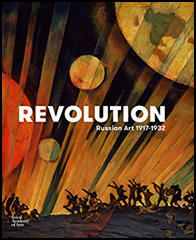 In 1939 he was appointed as a teacher at the Repin Institute of Arts. A member of the Leningrad Union of Artists he became Professor and Head of Department of Drawing in 1956 and the People's Artist of the Russian Federation in 1978. Piotr Petrovich Belousov died in Leningrad in 1989. 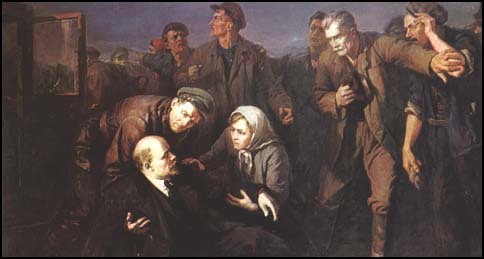 Piotr Belousov, painted a picture of the assassination attempt by Fanya Kaplan on Lenin. Lenin arrived alone; no one escorted him and no one formed a reception party. When he came out, workers surrounded him for a moment a few paces from his car. It was at this moment Kaplan fired at him, three times, wounding him seriously in the neck and shoulder. Lenin was driven back to the Kremlin by his chauffeur, and just had the strength to walk upstairs in silence to the second floor: then he fell in pain. There was great anxiety for him: the wound in the neck could have proved extremely serious; for a while it was thought that he was dying. The wounded man's own strength carried him through. Lenin was back on his feet in around ten days. The War Council of the Northern Caucasian Military Region, having learned about the wicked attempt of capitalist hirelings on the life of the greatest revolutionary, the tested leader and teacher of the proletariat, Comrade Lenin, answer this base attack from ambush with the organization of open and systematic mass terror against the bourgeoisie and its agents.